Pirin mountain is the second highest in Bulgaria after Rila mountain. It is situated in the southwest part of the country in a rather extended shape to the northwest and southeast between the rivers Struma and Mesta. 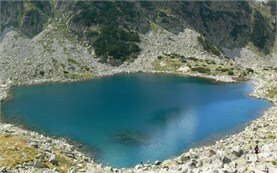 Pirin mountain, a glorious glacial landscape of peaks and lakes, offers some of the finest walking in Europe. Pirin has acquired an Alpine relief - rocky marble or granite peaks and cliffs, deep cirques, well shaped glacier valleys and numerous lakes. However, because of the well-expressed Mediterranean influence through the valleys of the Struma and Mesta rivers, it is the mountain with the greatest number of sunny days throughout the year and annual average temperature in the area of Vihren chalet (2000m) of -3.7C. Northern Pirin is the home of the highest peak, Vihren (2914m), of 60 others above 2500m, and of all glacial lakes (140-150 in number). It is also the place where one can find most of the region's ski resorts and hiking centers, as well as 12 chalets and 4 huts which are open for mountaineers the year-round. Because of its unique nature, in 1983 UNESCO decided to include the Pirin National Park in the list of the world's cultural and natural heritage. Rila is the highest mountain in Bulgaria and on the whole Balkan Peninsula. 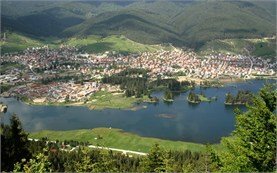 It is a part of the Rila-Rhodope Massif and occupies its north-east end. Rila seems to be a piece of the Alps thrown into the heart of the Balkans with its 130 Alpine peaks above 2000m, glacial valleys and lakes. The snow cover on the parts of average altitude and the Alpine parts often exceeds 2m. Eastern Rila is the highest part of the mountain where one can visit Rila's highest mount-Moussala (2925m) and the 10 top peaks, and the highest lake in Rila-the Glacial lake (2709m). 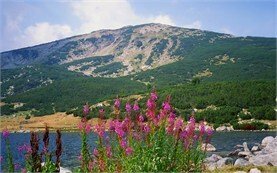 Northwestern Rila is the home to some of the symbols of Bulgarian alpinism and mountaineering-Malyovitsa and Kupenite peaks, and the biggest and significant lake groups, the most famous and scenic of all - the 7 Rila lakes. The most of the chalets and high mountain shelters are in this part of the mountain. Many marked tourist hiking trails and high-mountain rock climbing tours originate from here. The Balkan Range cuts right across the country - from the border with Serbia to the Black Sea coast, a forbidding mountain known to the Bulgarians as Stara Planina or the "Old Mountains". The 550km-long granite Balkan Range has become emblematic of Bulgaria - a birthplace of the Bulgarian nation-state and a place where Bulgarian traditions and culture have been preserved during the Ottoman occupation. It is also a climatic barrier between north and south Bulgaria with more snowfalls on its northern slopes than on the southern. Average temperature around Mount Botev, the highest peak (2376m), are -8.9C in January, and 7.6 in July. Its 29 peaks above 2000m, some of which definitely Alpine, are of great interest to tourists and climbers. The numerous alpine formations in the western part of the mountain-caves, rocks, gorges, attract extreme climbers and mountaineers. 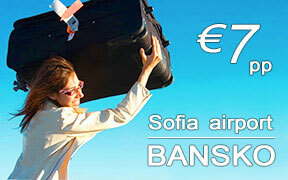 The Central Balkan range is the highest with the most tourist chalets and high-mountain huts. Hundreds of tracks have been marked, most of them leading to important historic and cultural places. A landmark is the National Park "Central Balkan" with 10 biosphere reserves under the protection of UNESCO.